There was a time when use of the term “multidisciplinary” in the context of haemophilia congresses meant the inclusion of a token nurse or a physiotherapist on a panel. 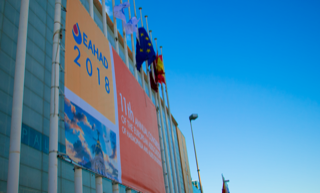 This year’s EAHAD congress, held in Madrid, had more nurses, physios and psychologists attending and presenting work than ever before. The pre-conference multidisciplinary day showcased the important work of the whole team, reinforcing the positive impact of physiotherapy and psychological support alongside the care and education provided by nurses: all support patients with managing their condition and developing self-management skills. After an initial scramble for translation headsets, the pre-conference day opened with a multidisciplinary session focused on practice in Spain. Madrid haemophilia nurse (and Haemnet favourite), Sara García Barcenilla, proved herself to be a rising star as she provided insights on her role and shared her experiences caring for children and youngsters. She emphasised the need to make the hospital environment as comfortable as possible for her patients, so they don’t associate clinic visits with fear, but rather grow up developing an understanding of and appreciation for their care. Physiotherapist, Sofía Pérez Alenda delivered a great presentation sharing findings from a study she conducted. In response to increasing weight gain and obesity among young people in general and in patients with haemophilia, Sofía showed low levels of physical activity in general but interestingly patients with haemophilia moved more than those without haemophilia except when it came to vigorous activity, which was understandable as many patients are advised against this. Her study showed that balance in patients with haemophilia was lower. She used the Wii Fit Board to measure and improve balance in a fun way through the inbuilt games as part of an exercise programme. It was fantastic to see technology that appeals to a younger audience being used to gather data and also have a direct benefit for patients. The EAHAD poster hall included some excellent demonstrations of nurse, physio and psychologist work. Shout outs go to Alison Grieg from St George’s in London for her evaluation of a shortened course of tranexamic acid for patients with inherited bleeding disorders following dental procedures, and to David Stephenson (East Kent and the Royal London), David Hopper (Newcastle) and Stephen Classey (St Thomas’s London) for their exploration of patient perceptions of ultrasound “selfies”. We were also pleased to see the evidence-based review of psychological approaches to pain management by Janet Cleary and Patricia Byrne from St James’s in Dublin. Overall, a big shout out to EAHAD for a conference that increasingly acknowledges the truly multi-disciplinary nature of modern haemophilia care. Let’s hope we see even more next year.